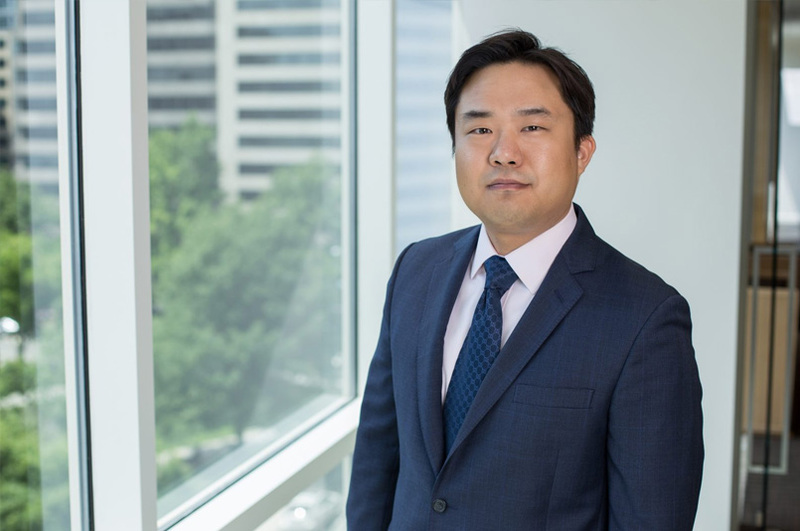 Hyun Jin (HJ) In is an Associate in the Washington, D.C., office of Fish & Richardson. His practice emphasizes patent prosecution and litigation as well as post-grant work in a wide range of technology areas including mechanical and electrical devices, batteries, software, and medical devices. As a member of Fish’s post-grant team, Dr. In has been involved in over 30 inter partes review and covered business method review proceedings. He was formerly a Technology Specialist, Patent Agent with the firm. Prior to joining the firm, Dr. In worked in the Chemistry Division of the Naval Research Laboratory where he developed next-generation chemical and biological detection systems. Dr. In also has extensive research experience in mechanical engineering, nanotechnology, MEMS, energy storage, semiconductor processing, and optics. H. J. In, C. R. Field, P. E. Pehrsson, “Periodically porous top electrodes on vertical nanowire arrays for highly sensitive gas detection,” Nanotechnology, 2011, 22:355501. C. R. Field, H. J. In, N. J. Begue, P. E. Pehrsson, “Vapor detection performance of vertically aligned, ordered arrays of silicon nanowires with a porous electrode,” Analytical Chemistry, 2011, 83(12), 4724­4728. C.-H. Chang, H. J. In, S. Takahashi, M. Deterre, H. J. Choi, K. W. Gotrik, G. Barbastathis, “Assembling nanoparticle catalysts with nanospheres for periodic carbon nanotube structure growth,” Nanotechnology, 2011, 22:035301. H. J. In, H. Lee, A. J. Nichol, S.-G. Kim, G. Barbastathis, “Carbon nanotube-based magnetic actuation of origami membranes,” Journal of Vacuum Science Technology B, 2008, 26(6), 2509-2512. G. J. La O’, H. J. In, E. Crumlin, G. Barbastathis, Y. Shao-Horn, “Recent advances in microdevices for electrochemical energy conversion and storage,” International Journal of Energy Research, 2007, 31(6-7), 548-575. H. J. In, S. Kumar, Y. Shao-Horn, G. Barbastathis, “Origami fabrication of nanostructured, three-dimensional devices: Electrochemical capacitors with carbon electrodes,” Applied Physics Letters, 2006, 88:083104.